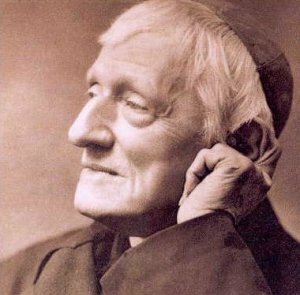 Pray for us, Blessed John Henry Newman! What was Blessed Newman’s miracle? David, would you believe my grandmother (+2010 at 101 y.o.) was a Newman (and an Anglican) who told me many years ago that we were related to John Henry?! Obviously not in the direct line, but his father and her great grandfather were brothers or cousins or some such. She was a great one for oral history, so I’m inclined to believe her, and it was all tied in with Huguenot ancestry, which Newman certainly had. Perhaps adding to the credibility of the story, in her later years, she was the splitting image of the beatified one as you have pictured him, I kid you not. So, I’m related to a RC saint…imagine that! Surely you could confirm that story with a bit of investigation, Mark? JHN didn’t live that long ago – there can only be a couple of generations involved. I would be very interested. I’ve tried to follow it up from here but the trail ends in Essex c.1839. There is surprisingly little info on Newman’s family available on the net, apart from his brother, who was almost equally notorious. It will have to await a personal trip to the UK, I think. Not that it’s ever mattered much to me, John Henry was such an odd character, after all. Interesting, but odd, and a great mis-reader of Luther to boot! Did he, in fact, read Luther? I don’t know if he did. Like many in England in his generation, he more probably relied more on second hand material. Hard to know how much Luther was even available in English at the time. Certainly not what we have today. Newman was better informed on Arius than Luther! Yes he did, or if he didn’t he pretended to have had. Check his writings on justification. But I agree, he was more familiar with Arius than Luther, although I hope you are not implying anything by lumping Luther together with that arch-heretic, David. You do, after all, still claim to be a Lutheran!